No doubt about it, nausea is one of the most unpleasant sensations on the planet. There are few things worse than feeling queasy to the point where you have to vomit. A lot of remedies have been suggested over the years to combat nausea, including over-the-counter drugs and alternative medicines. The most well-known of the herbal cures is likely ginger; however, here’s another one that hasn’t gotten as much press—mint essential oil. A team of researchers from Iran tested both spearmint and peppermint essential oils in cancer patients, all of whom were suffering from nausea and vomiting as a result of their chemotherapy. The research team divided the patients into three groups: group one received spearmint essential oil treatment, group two received peppermint essential oil treatment, and group three acted as a control by continuing with their usual treatment for nausea. The researchers had everyone record the number of times they vomited and the severity of their nausea throughout a 20-hour period when they underwent chemo treatments. The patients were also asked to record any negative side effects. 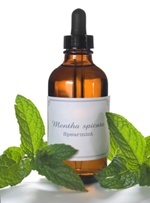 The research team discovered that both the spearmint and the peppermint triggered a significant drop in the intensity of the patients’ nausea post-chemo, as well as reduced episodes of vomiting. For those spending a lot of money on anti-nausea medication, mint essential oil could be an effective and cost-saving alternative. Mint can be used for more than just treating nausea, of course. It’s a great all-around tonic that could help ease digestive troubles. The herb has also been used to clear up skin blemishes, freshen breath, and help remove toxins from the body. To get all these health benefits, try drinking mint tea. This herb is very easy to grow in the garden—you don’t need a green thumb at all! Just plant a sprig and watch the herb spread and blossom into a healthy plant within weeks. Pick the leaves and boil them in a pot of water in the kitchen and voila, you have a cup of all-natural, healing mint tea to drink. Nasiri, R., et al., “Antiemetic activity of volatile oil from Mentha spicata and Mentha × piperita in chemotherapy-induced nausea and vomiting,” Ecancermedicalscience 2013; 7: 290.